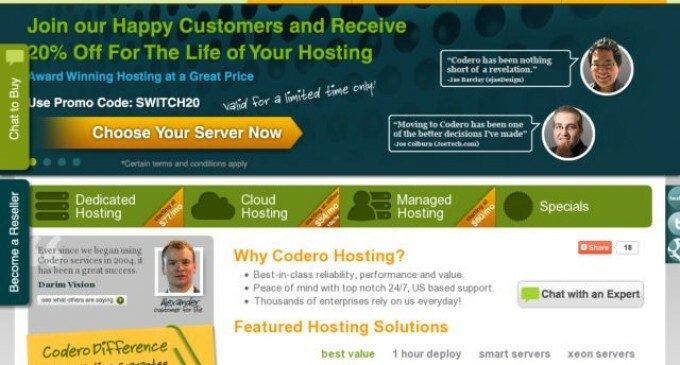 Hosting News –Lenexa, Kan. – Codero is assisting those individuals and companies needing hosting services to resell to their own customers by offering them four flexible hosting tiers within a comprehensive program. The responsive Reseller Program offers volume discounts from list pricing on dedicated servers and setup fees. Codero provides optimized infrastructure to customers in the e-commerce, SaaS, web development, advertising and media sectors and invites them to capitalize on the services and products which Codero has refined over the past 15 years. As part of the Codero Reseller Program, resellers can conveniently tap into Codero’s IT expertise and inventory to repackage and resell hosting products and services. Research, evaluate and learn more about website hosting at FindMyHost.com.